Zaption is a downtown San Francisco edtech startup. It is the brainchild of Charlie Stigler, 21, a software engineer who dropped out of Columbia University. The Idea Charlie Stigler wanted to make it easy and quick for teachers, trainers and content publishers to create interactive and engaging educational video lessons with images, text, quizzes, and discussions using existing videos from YouTube, Vimeo and personal videos. Additionally, with Zaption’s analytics, instructors get immediate feedback on how students interact with the content and understand key concepts. The basic author plan is free, which allows anyone to watch unlimited tours (video lessons), create and share tours, track viewer progress, and copy and edit ready-to-use tours. Here’s an excellent example. Let’s Rock is created by a high school teacher who uses visually stunning imagery to get students interested in studying geology while teaching basic concepts. Turn your speakers up! Back in 2012, Charlie Stigler had a dream and the Thiel Fellowship of $100,000 he had just won helped make it come true. Since then Stigler’s company has grown to six employees and raised a total of $650,000 seed funding from investor Dr. Michael J. Burry and the NewSchools Venture Fund, a nonprofit venture philanthropy firm working to transform public education for low-income children. Vision Charlie Stigler is the CTO and Co-Founder of Zaption. He is a remarkable young man with a vision. He wants to create something that will improve the lives of people. Entrepreneurial Background Another factor that contributed to his success is that Stigler grew up immersed in entrepreneurship. His father is both a professor of developmental psychology at UCLA and an entrepreneur who has started up two companies focused on education. His mother is currently developing a computer-tutoring service for older people in her neighborhood. Entrepreneurial Spirit Stigler began developing and selling iPhone apps in his sophomore year of high school, and wrote popular open-source study application SelfControl. That summer he founded his first company, Cubicl, with three seniors. He started working with his father on Zaption as a high school senior. Leaving Columbia was not an easy decision, but some ideas just couldn’t wait. Stigler was able to seize the once-in-a-lifetime opportunity to accept the Thiel Fellowship which gave him the kind of mentoring and financial support he needed to work on his projects. Charlie Stigler had incredible support from people who wanted him to succeed. While at Columbia, Stigler was on the lightweight rowing team and when he had to leave Columbia for five days to interview for the Thiel Fellowship, it coincided directly with an important home race but his coach gave him a hugh-five! He also had support and encouragement from Columbia to take two years off to receive the prestigious fellowship. 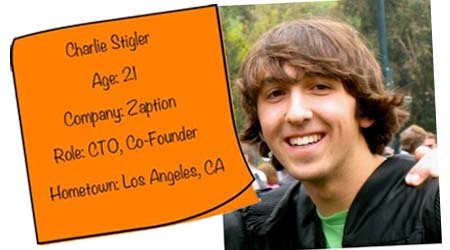 Jim Stigler: Co-Founder Charlie Stigler co-founded Zaption with his father Jim Stigler who is a professor, researcher, author and entrepreneur. He is an associate dean at UCLA, co-founder of Startup UCLA, and led the video studies for TIMSS – the international project to compare math education. Jim is also the author of two popular education books, The Teaching Gap and The Learning Gap, and his previous company, LessonLab, was an early innovator in online video for education. LessonLab was acquired by Pearson in 2003. Chris Fitzgerald Walsh: CEO Chris Fitzgerald Walsh leads Zaption’s business development and operations. He previously led product development and strategic initiatives for New Tech Network, and was the co-founder of Brightstorm. Chris is also the creator of the Infinite Thinking Machine. Chris earned his M.A. in Learning, Design & Technology from Stanford, and a B.A. and M.Ed. from UCLA. Fiona Nowlin: Customer Happiness Guru Fiona Nowlin is responsible for delighting Zaption’s customers with world class support and training. She is an experienced researcher, project manager, and ed tech trainer who worked for the University of Michigan’s School of Education before joining Zaption. Fiona earned a B.A. in Psychology and Modern Greek from the University of Michigan. Background, skills and motivation are prospective and prescribed attributes of successful entrepreneurs. I also believe that independence and an inexhaustible drive are critical prerequisites, which Charlie Stigler obviously has. At the young age of 19, he made clear, informed choices about what he wanted to do and set out to do just that. It makes a lot of sense to me when technology entrepreneurs like Peter Thiel, co-founder of Paypal, embark on philanthropy which funds worthwhile tech ventures and provides opportunity for new, unproven ideas to grow. Presenting the challenge “Tell us how you would like to change the world”, his 20 Under 20 Thiel Fellowship asks young people to reconsider higher education and drop out for a time to learn by doing, especially by forming companies with a change-the-world objective. Recipients of the fellowship are given $100,000 with no strings attached and are mentored by a network of visionary thinkers, investors, scientists, and entrepreneurs who provide guidance and business connections that can’t be replicated in any classroom. I find the story of Charles Stigler and Zaption inspiring because it reflects the amazing times we live in. Never in history have there been so many opportunities for entrepreneurs to become successful beyond their wildest dreams. The Thiel entrepreneurial model prizes creativity and bold thinking. Rather than getting weighed down by huge student loans that severely limit the range of things they can do with their lives, young people now have opportunities to grow their ventures and attain levels of success that may otherwise be unreachable. I especially love that the venture genesis is an idea that is incredibly simple and focused – what unmet need could lead to a venture? The unmet need is that while videos abound, teachers and trainers want to be able to put them together easily to make interactive lessons. Zaption shows that small ideas can truly be big. Stigler’s previous work is also a very simple idea. It is an open-source Mac focus application SelfControl that lets you block your own (yes!) access to distracting websites, your mail servers, or anything else on the Internet. Hope this venture inspires all of us to look around for simple ideas and solutions and our own tech venture story! Kolodny, Lora. (2013). How I built it: Why Thiel supports dropouts. Wall Street Journal Eastern edition [New York, N.Y] 19 Dec 2013: B.5.